NEW YORK - Former Massachusetts Governor and Republican Presidential candidate Mitt Romney said he would release his 2010 tax return and an estimated tax return for 2011 on Tuesday in the wake of a stinging defeat in the South Carolina primary and renewed pressure from fellow Republicans. Speaking on Fox News Sunday with host Chris Wallace, Romney admitted he had made a mistake in not releasing the tax returns earlier. After initially saying he might not release his tax returns at all, Romney said last week that he would release the tax returns around April 15. But demands for his tax returns have been escalating over the past week. New Jersey Governor Chris Christie is among those who have publicly urged Romney to release his tax returns. 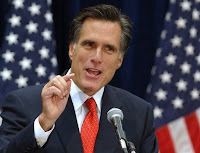 Romney also disputed accusations that his holdings in Bain Capital funds based in the tax haven of the Cayman Islands were intended as a way to evade taxes. "The taxes paid on that are full U.S. taxes," he said. "I know people will try and find something. But we pay full fair taxes, and you'll see it is a substantial amount." Romney said the tax returns would be posted to his campaign Web site for anyone to view. “It will provide, I think, plenty of information for people to understand that the sources of my income are exactly as described in the financial disclosure statements that we put out several months ago,” said Romney. His campaign also urged rival Newt Gingrich, who won the South Carolina primary on Saturday, to release his contract with Freddie Mac. Gingrich has insisted that he only acted as a “strategic advisor” for the housing agency, but rival candidates have accused him of being an unregistered lobbyist. Gingrich released his tax returns last week and on Monday evening his former consulting firm released the first year of his contract with Freddie Mac. During a Republican candidate debate Monday evening in Tampa on NBC, Romney told the audience and his fellow candidates, "You'll see my income, how much taxes I've paid, how much I've paid to charity. I pay all the taxes that are legally required and not a dollar more. I don't think you want someone as the candidate for President who pays more taxes than he owes." The Associated Press saw a preview of Romney's tax return and said he paid about $3 million in federal income taxes in 2010 on $21.7 million in earnings. Donations of close to $3 million to charity, about half of which went to the Mormon Church, lowered his effective tax rate to approximately 14 percent. In 2011, Romney is expected to pay approximately $3.2 million in taxes, an effective tax rate of about 15.4 percent.